Due to its perfect location close to the A4 and A1 motorways, the Spodek Arena can be accessed easily from many places in Poland and Europe. Numerous car parks located near the Spodek Arena make the facility comfortable to use. The nearest KZK GOP tram and bus stops for the Spodek Arena are the Katowice Rondo, Katowice Spodek, or Katowice Uniwersytecka stops. The Spodek Arena is located 30km away from the Katowice International Airport in Pyrzowice. It takes around 30 min. to get to the airport by car. You can go to the Spodek Arena from the airport in Pyrzowice by taxi (cost is approx. PLN 100) or by bus (fare is approx. PLN 30) Taking a bus from the airport, one has to go to the Katowice Sokolska stop (1km away) or the Katowice Hotel Novotel stop (850m away). Due to its close proximity to the airports in Kraków-Balice (70km, approx 50 min.) and Ostrava (130km, approx. 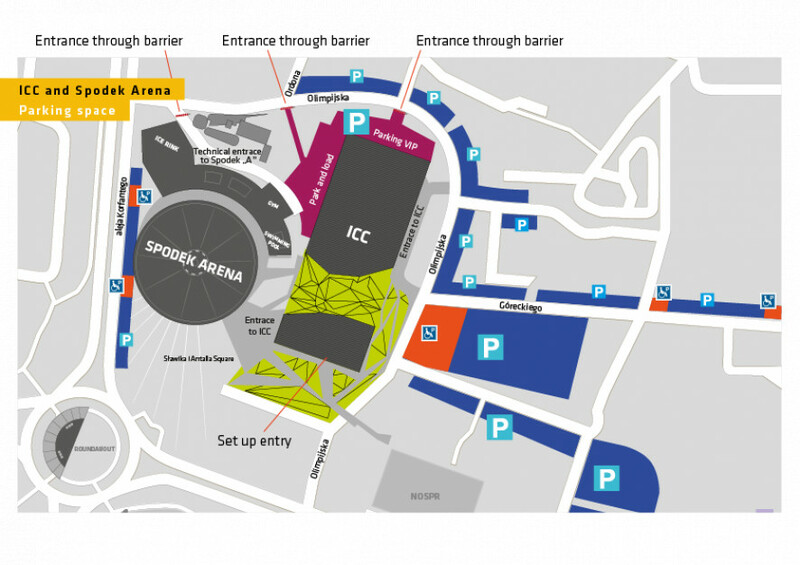 1.2h) the Spodek Arena can easily be accessed from many places in Poland, Europe and around the world.